Globe gives customers another reason to enjoy their digital lifestyle with the all-new Globe Switch App! This all in-one-app solution gives Globe Prepaid/TM customers affordable access to the hottest apps and lets them discover the best online deals. In addition to the exclusive mobile offers, Globe Switch sets itself apart with its data management and usage tracking capabilities. 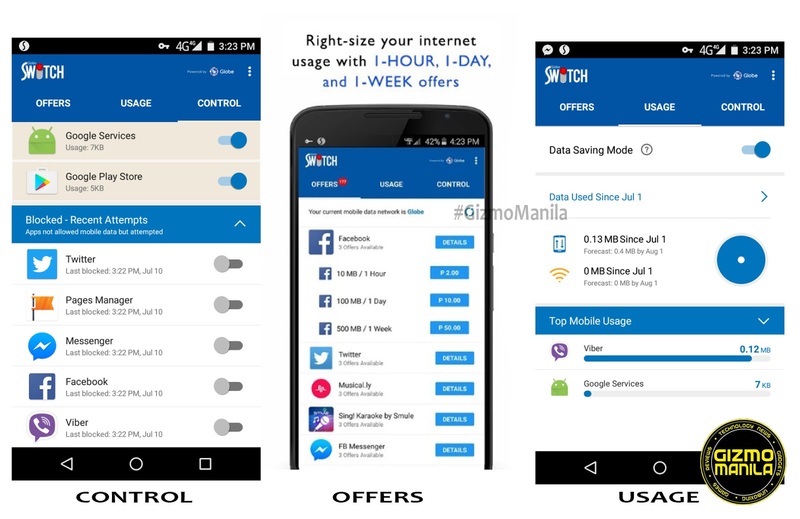 Under Offers are the best app deals that are only exclusive within Globe Switch. These deals are ready for download, ideal for those new to navigating online and using mobile data. Users can freely try and purchase these deals at a more affordable price. Globe Switch is your gateway to more than 3 GB worth of access to over 50 of the most popular apps. Purchases are conveniently charged to ones prepaid load, while some apps are permanently FREE to explore. With the Control feature, users are given a way to properly regulate which applications consume data charges. Certain apps can be turned on or off, preventing unexpected data consumption from some apps that are rarely used. It gives feature visibility into how much mobile data and WIFI each app is consuming on an hourly, daily and 12-day basis, alongside a data saving mode. Also, upon opening an app that consumes data, Globe Switch will automatically notify the customer on how long they want to use the app and consume data. Users can enjoy up to 3GB worth of mobile data over 50+ app to use. Also Globe Switch gives customers more confidence to discover and explore amazing deals online! As a special launch treat, starting July 21 and for a limited time only, Globe is giving the first 500,000 Globe Switch users free 5 days access to the app of their choice! Users can avail of the "Special Launch Day Treat" option under the OFFERS tab to choose their free app. They also announce the phenomenon Pokemon Go Game, that once it officially release in the Philippine market Globe subscribers can enjoy Pokemon Go FREE 7 day access with Globe Switch app. Globe Switch is free and available for download on Google Playstore only. To learn more about Globe Prepaid and its latest offers, visit www.globe.com.ph/Prepaid. Globe Switch is also available for TM subscribers.